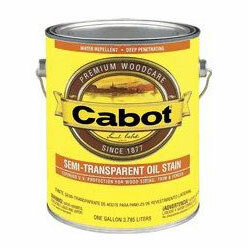 Cabot Semi-Transparent Stains are deep penetrating, linseed oil-based stains that beautify and protect exterior wood. These lightly pigmented stains enhance the natural beauty of the wood by allowing the grain, texture, and color variations within the wood to show through. Acrylic 1300 series combines penetrating properties of oil-based with e..
Cabot Semi-Transparent Stains are deep penetrating, linseed oil-based stains that beautify and protect exterior wood. These lightly pigmented stains enhance the natural beauty of the wood by allowing the grain, texture, and color variations within the wood to show through. Acrylic 1300 series combines penetrating properties of oil-based with easy soap-and-water clean-up of water-based finishes. Will provide long-lasting, vapor-permeable protection that beautifies and enriches exterior wood surfaces. Formulated with non-fade, earth tone pigments to weather slowly over time. On smooth surfaces, approximately 450-650 square feet per gallon; on rough surfaces, 200-300 square feet per gallon. 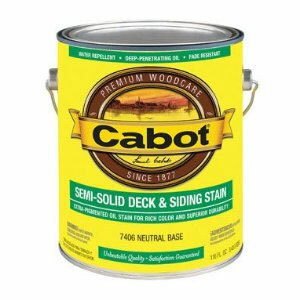 Cabot Semi-Transparent Oil Based Stains are for use on exterior wood decks, siding, fences, shingles and roofs. Acrylic water based stains are for use on exterior wood siding, shingles, shakes and roofs. They are especially effective on rough-sawn surfaces; and excellent results are obtained on premium grade lumber such as cedar, fir, pine, cypress, spruce, redwood and plywood panel siding.